There aren’t too many books in English that deal specifically with cacti and succulents. Some of the classic references that were published some years ago are now out of print. You may be lucky enough to find some of them in public libraries. In addition to books that are devoted entirely to these plants, there are other titles worth considering. Typically, these will often have entire sections or chapters on cacti and/or succulents. Let’s take a look at some books that feature information on cacti and succulents. “Trees, Shrubs, and Cacti of South Texas” by James H. Everitt et al from Texas Tech University Press is an excellent reference on native cacti. This is the third edition of a popular field guide for the area. It covers fourteen counties in South Texas. Each plant is illustrated in full color with a description, details on the flowering time, habitat, and location along with miscellaneous details of interest. The plants are organized by family with a detailed, easy to use ID key. 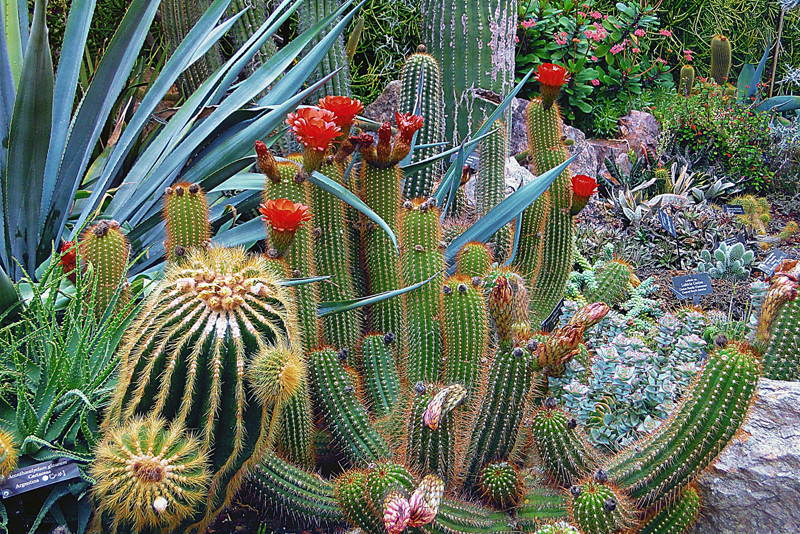 Over twenty species of cacti are featured along with various species of Euphorbias, and agaves. At the end of the book, the authors feature all sorts of helpful information, including line drawings showing the different leaf arrangements and forms along with a glossary. Often, garden encyclopedias give little attention to cacti and succulents. Happily, “The Complete Encyclopedia of Garden Plants” with Kate Bryant as chief consultant is a wonderful exception. Published by Thunder Bay Press, this guide devotes an entire chapter to these plants. It features a marvelous introduction to cacti and succulents, referring to them as ‘the camels of the garden.’ Over twelve different genera are discussed. For each group, there is a handy table listing the favorite species or cultivars with complete descriptions, hardiness zones, bloom time, and much more. The plants are beautifully illustrated with lots of gorgeous color photos. This book also features chapters for every kind of ornamental and edible plants, including one for ferns, palms, and cycads. In the introduction, gardeners are introduced to the idea of gardens for year-round beauty. This comprehensive encyclopedia gives details on how to grow and care for the different kinds of garden plants, their hardiness, and how to choose suitable species/cultivars. At the end of the book, there is additional information, including a glossary, a seasonal calendar, and an index to plants. In many areas of the country, American gardeners are urged to conserve water. One of the most helpful books around on xeriscaping is “Gardening the Mediterranean Way-How to Create a Waterwise, Drought-Tolerant Garden” by Heidi Gildemeister from Harry N. Abrams. Wherever you garden, you can benefit from the author’s extensive gardening experience in dry climates. She is founding member and former president of the Mediterranean Gardening Society. The book focuses on techniques and plants that will survive in hot, dry areas without being invasive. It features twenty inspiring garden designs, many of which include cacti and succulents. Among these are gorgeous container gardens, edible gardens, and mini or pocket gardens. Throughout this lushly illustrated volume, the author emphasizes how gardeners can crate a garden that is in harmony with its surroundings. One look at the cover of “A Bat Man in the Tropics-Chasing El Duende” by Theodore H. Fleming, and you know this title relates to cacti and succulents. Published by the University of California Press, the dust jacket shows a bat flying towards a cactus flower. A leading bat biologist in the world, the author has written several other books on bats, including “Columnar Cacti and their Mutualists: Evolution, Ecology, and conservation.” In this volume, he writes about his adventures in the New World, and Australia during his thirty years of fieldwork. During his career, he has documented how important plant-visiting bats are to cacti, agaves, and other plants. Studying some of these bat species was by no means easy. In some cases, he had to track them during their migrations, and spent countless hours watching the bats feed at night on the flowers. Throughout the book, he stresses the need for conservation. When it comes to sources on New World plants, the place to look is “Flowering Plants of the Neotropics,” edited by Nathan Smith et al from Princeton University Press. This superb title will doubtless become a classic reference for gardeners and plant lovers as well as professionals in the field of botany. With contributions from 150 botanists, this exquisitely illustrated, authoritative guide has over 300 color photos and nearly as many line drawings. It presents complete information for nearly 300 plant families, including ones with cacti and succulents. For each family, you’ll find details on the economic use, natural history, plant descriptions, habitat, geographic locations, and the number of species representing the group. At the end of the book, there is a comprehensive glossary as well as a key to use for identification purposes. Along with other gardeners, cacti and succulent lovers are hungry for information on their favorite plants, and these are only some of the available titles that satisfy that need.